This set of three distinct extra virgin olive oils from award-winning producer, Olio Guglielmi is the best way to sample what the Puglia region has to offer. ROBUSTO: Light green in color yet robust in flavor, this extra virgin olive oil is produced exclusively from locally harvested Coratina olives and has an intense aroma of young almonds with a pleasantly bitter and peppery flavor with a finish of almond and artichoke. 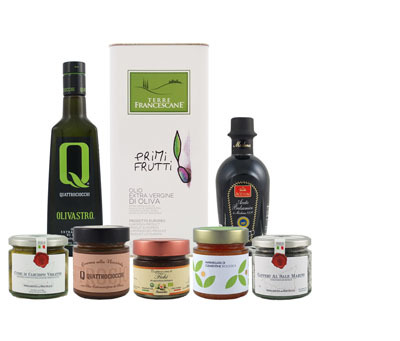 Ideal when used with roasted meats, grilled vegetables, full-flavored sauces and drizzled over bruschetta and pizza. LEGGERO: Specially crafted from a blend of locally grown Leccino, Ogliarola and Peranzana olives, varieties known for their soft and round taste, this is the ideal olive oil for those who love harmonious flavors. Leggero lends a sweetness to the palate with flavors of almond and apple, combined with the lively aromas typical of the blooming Puglian countryside. This oil is perfect for finishing fresh garden vegetables, green salads, grilled fish and soft cheeses. BIOLOGICO: This organic extra virgin olive oil is obtained without the use of pesticides and fertilizers, using attentive care for the environment and nature by safeguarding the territory from which it is obtained. Cold-extracted exclusively from Coratina and Peranzana olives and rich in healthy polyphenols, this oil is intensely fruity with a powerful vegetal aroma of artichoke, arugula and chicory with subtle hints of almond and rosemary. This oil pairs well with roasted meats, carpaccio, hearty soups and grilled vegetables.